In its basic version, Certigna server certificate -including SSL, SSL RGS*, and Server Client RGS* products - secures a main domain and for sub-domains of the main domain. Certigna now offers more flexibility when it comes to adding SANs in its certificates. One certificate can now secures several SANs linked to different domains. WARNING: Once the certificate is delivered, it can't be modified. The list of domains and sub-domains cannot be edited via reissuance. The first domain and its 4 first sub-domains are included in the certificate price. Additional sub-domains are billed (see Certigna certificates prices). The first SAN securing another domain is called "Domain SAN" and is billed at Domain SANs specific prices (see Certigna certificates prices). 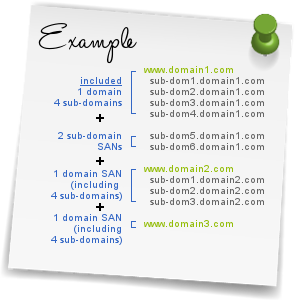 A Domain SAN comes with 4 sub-domains. Additional sub-domains are billed at additional SANs prices (see Certigna certificates prices). This calculus must be applied to each new "Domain SAN" to be secured.